One of the motivations for making good water management decisions early in the growing season is to reduce risk of root and crown diseases that can eventually kill almond, walnut, prune, and other tree species. These diseases need three elements to infect and damage a tree: a susceptible host plant, a pathogen, and favorable environmental conditions. Early season water management influences the environment where roots grow by affecting soil temperature and aeration and can be pivotal in how much tree decline actually occurs. Trees are expensive. The money and effort spent to establish them is lost, more costs lie ahead to replace them, and production is lost. Each season you need to decide when to start irrigating. It can be difficult to choose the best time to start irrigation. There’s a lot of different information sources you can use to make this decision. You can copy practices that you observe around you, evaluate soil moisture, consider the weather and evapotranspiration loss of the crop (ETc), or take a plant-based approach and in a sense “ask your trees” if they need to be irrigated. Utilizing multiple information sources for an important decision like this is highly recommended. Utilizing the plant-based monitoring approach of “stem water potential readings with a pressure chamber” has a distinct advantage over the others. The pressure chamber (Figure 1) directly determines the water status experienced by the trees, while the other sources such as ET or soil moisture, although helpful are indirect. The pressure chamber gauges the amount of positive gas pressure (in pressure units, e.g. bars) required to balance the level of water tension in a plant sample (e.g. leaf). The level of water tension in a leaf expresses the degree of effort utilized to pull water all the way through the tree from the soil. Relying on an indirect information source, particularly an approach like beginning irrigation when your neighbor does, when the surface soil has dried out, or irrigating on the first hot day, could result in irrigating too soon. Figure 1. 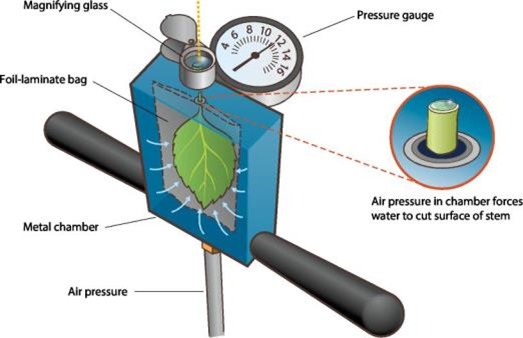 Schematic showing how water potential is measured in a severed leaf and stem (petiole) using a hand-held pump-up pressure chamber. Source: Adapted from Plant Moisture Stress (PMS) Instrument Company. See our Stem Water Potential series to learn more about the pressure chamber, stem water potential, the fully watered baseline, how to go about getting equipment and taking measurements. Research in a walnut orchard in Tehama County has found that start of irrigation can be delayed by waiting for mild to moderate water status when measured with the pressure chamber. Some observed benefits have been a minimum 10 percent reduction in energy for pumping, less tree stress during harvest season, and no impact on edible kernel yield. A managed (informed) delay in start of irrigation may allow for deeper root activity late in the season. Possibly, an irrigation strategy that starts the irrigation season too early promotes a shallow root system at the expense of deeper root development. UC researchers will be repeating this investigation in almonds in the Northern Sacramento Valley. If using the pressure chamber isn’t appealing or a second source of information is desired, monitoring the weather and evapotranspiration (ET) crop losses is an option. This method is sometimes called a “water budget”. It is analogous to budgeting money. Soil water storage in the crop root zone equates to a balance in a checking or savings account. ET equates to a debit from the account and significant rainfall or irrigation equates to a deposit or credit into the account. Water budgeting approximates the soil moisture level in the root zone rather than measuring it with soil moisture sensors. The goal is to avoid extreme imbalances. Weekly ET reports are available during the irrigation season online. ET is estimated based upon real-time weather measurements at eight regional CIMIS weather stations across the Sacramento Valley. Estimates are for trees with at least 50 percent canopy cover and need to be adjusted downward for smaller trees. Each report provides a real-time estimate of ET in inches for the past seven days and an estimate for the next seven days and keeps a running total for the season. Accumulations begin at leaf out for each crop which enables their use to help decide when to begin the irrigation season. It is important to know the hourly water application rate (inches/hour) of your irrigation system. Using an example from the 2018 season, if we followed each weekly report from February 16 – May 3 for the Gerber South CIMIS weather station, it showed that cumulative ET for almonds was 7.51 inches while cumulative rainfall for the same period was 5.26 inches and resulted in a 2.25 inch soil moisture deficit. This assumed that all of the rainfall was effectively used in the orchard which is a site specific consideration that needs to be adjusted accordingly in the water budget. Dividing this 2.25 inch soil moisture deficit by a water application rate of 0.07 inch per hour (i.e. an almond orchard with 124 trees per acre with one 16 gph microsprinkler per tree) equates to 32 hours of irrigation or the equivalent of two 16 hour irrigation sets that suit PG&E off-peak rates. Choice of set length is site specific consideration depending on irrigation system and soil type, however it is best to minimize ponding conditions that can starve roots of oxygen and provide favorable disease conditions. The previous example provides context of how this deficit relates to the irrigation system capacity. It is left to the irrigation manager’s judgement to continue to delay the beginning of irrigation to protect tree and root health, begin irrigation by partially refilling the soil moisture deficit (i.e. one 16 hour irrigation set), or begin irrigation and fully replace the soil moisture deficit. If this information were paired with the pressure chamber measurements and the stem water potential measurements were still within -2 bars of the fully irrigated baseline, the manager may have more peace of mind about continuing to delay the first irrigation. If neither the pressure chamber nor water budgeting appeal to you or you are looking for a backup to one or both of these methods, directly monitoring soil moisture is an option. Checking soil moisture by hand is a very basic method to evaluate soil moisture conditions. There are many online stores where soil augers can be purchased (try: JMC Backsaver, AMS samplers; Forestry Suppliers; and/or Ben Meadows). The USDA, NRCS also offers a nicely prepared publication with color pictures titled Estimate soil moisture by feel and appearance.